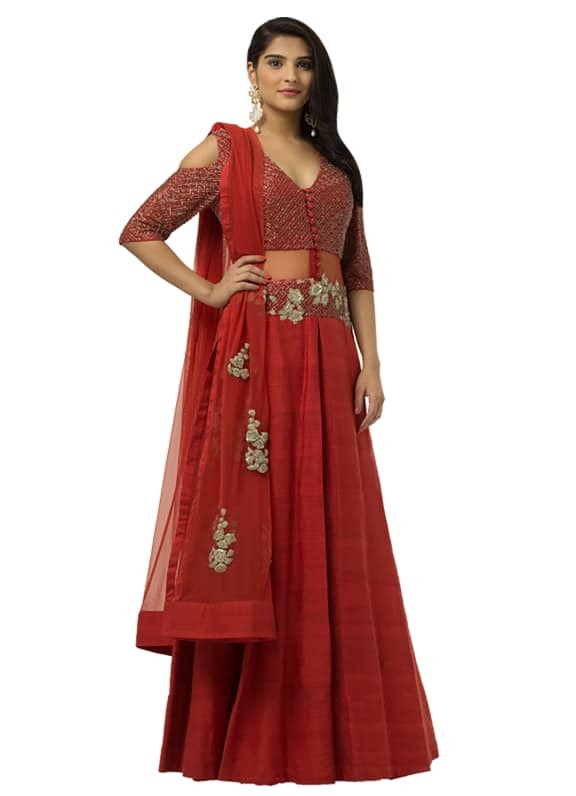 This georgette and net red anarkali has gold sequins embroidery on top. 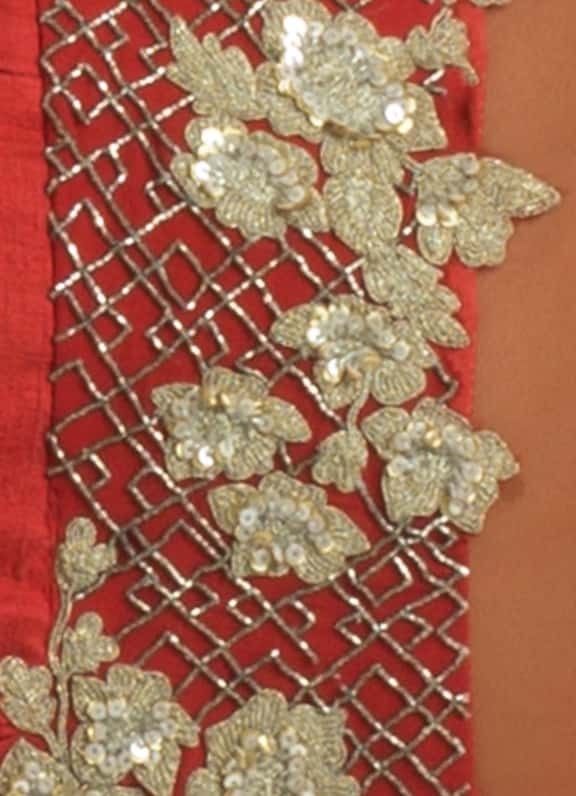 There’s white and gold thread work around the waist. 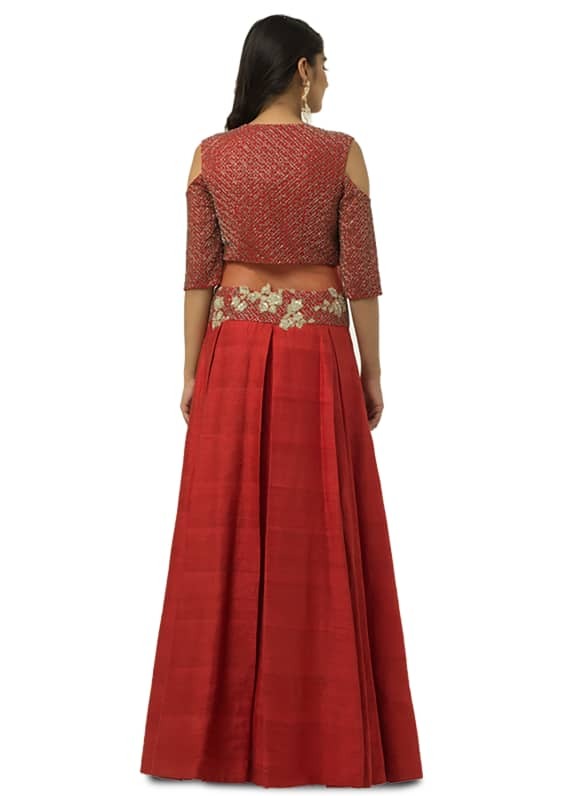 This is a sleeveless anarkali with a net dupatta. Ridhi Mehra makes you look gorgeous in her deep red long flowing Anarkali, adding modernity to this classic silhouette with delicate and beautiful embroidery on top. Style this regal look with silver and pearl earrings from Amrapali. Stage3 is India's leading fashion rental portal. With us, you can rent leading womenswear and menswear designers and latest trends for any occasion. Dress to impress for brunches, official lunches, date nights, club nights, cocktails or weddings. Dreading the wedding or have a vacation on the cards, look no further. Now there's more! Inspired by the latest global trends, rest assured you will always be ahead of trends when you shop with us. Be on-trend for any special occasion with our designer capes, lehengas, forward capes, jackets, dhotis, pant-suits, anarkalis, dresses, suits, sherwanis, tuxedos, jackets, and gowns. We offer the best of the latest fashion inspired by the latest in celebrity fashion, making it a one-stop shop for trend and glamour. We believe fashion is for everyone and don’t let your wallet tell you any different. We make sure that our clothes not only make you feel great but are also value for money. 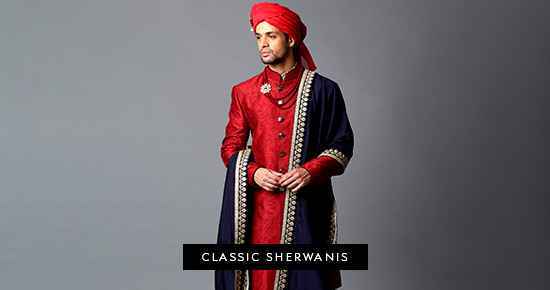 Rent contemporary ethnic wear and fun party attire, starting from 999! Get exclusive and affordable fashion at your fingertips be it for summer parties, vacation outfits, winter weddings, Diwali or Valentine's day. And as we always say, dress glamorously for less! Premium Designers. Endless Styles. In-Budget. Glam up effortlessly and feel more confident, within your budget. So, move over bargains, discounts and sales- rent exclusive and glamorous designer wear at a fraction of their retail price. We stock classy ethnic, festive and western wear from the best Indian designers including Sabyasachi, Masaba Gupta, Manish Arora, Ridhi Mehra, Gauri & Nainika, Anamika Khanna, Payal Singhal, Anju Modi, Anita Dongre, Gaurav Gupta, Shantanu & Nikhil and more. We marry data and design seamlessly to provide our customers with the highest level of customer service. Our team of stylists and designers are constantly keyed in to the latest trends and celebrity looks. We know what you’re looking for, even better than you do! We offer personalized style advice based on your need, body type and preference. Styling advice? Home fittings? Matching accessories? Effortless pick up and drop? Let us do it for you. We offer the best in-class convenience and comfort for your special days. We offer free delivery, pick up and advance booking for western wear, custom fitted ethnic wear and menswear. We work with our team of experts who who work from start to finish to ensure your orders are customized, sealed and delivered, to perfection, in time, just for you. Celebrities and fashion bloggers including House of Misu, Niki Mehra, Shilpa Shetty, and Shereen Bharwani of LOAB are fans too! So, next time you want to look like a celebrity or your favourite fashion blogger, you know Stage3 is where you have to look! For an upcoming event, you no longer have to splurge unnecessarily. Now you can just rent the best of the latest fashion even for a simple dinner date. And rest assured, you can get the delivery for that luxurious designer gown for any important event in no time. Be it a bridal lehenga, a designer outfit for festivals or tailored suits and sherwanis for weddings, Stage3 has got you covered! We always have new arrivals in store for our fashionable brides, grooms, bridesmaids, groomsmen and wedding attendees. So always be red carpet ready at affordable prices and never repeat the same outfit twice.